I got back from Mt. Popa by lunchtime and even though i had to bear with the 30,000kyats expense (discounted from the originally-quoted 35,000kyats), I had to take on the horse cart rental I paid for in advance the previous day. Since I paid for a whole day's tour (12,000kyats or $12), I revised my destination from New Bagan (only 7 kms. away from Nyaung U) to Tuyin Taung (27 kms. 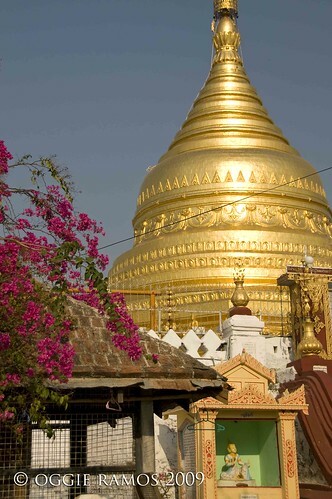 away) on the tip I got from an acquaintance I made in Shwezigon Pagoda. To compound my day's woes, I got assigned to a very lazy driver (whose name I'm not going to mention). First, he complained about not having lunch (so I gave him 1,000kyats so he can drive on a full stomach). Then, he made a stopover midway our trip so he can rest while his cousin attempts to sell me stones with jade on them. Tsk, tsk. (Later, he would ask me for an extra 1,000kyats to which i really said no in no uncertain terms). After over an hour, we see hills rising above the plains. The Tuyin Taung Pagoda overlooks the Ayeyarwaddy River bank of Bagan.I n contrast to the other pagodas I visited earlier, the hills are practically desserted save for two men on bikes. 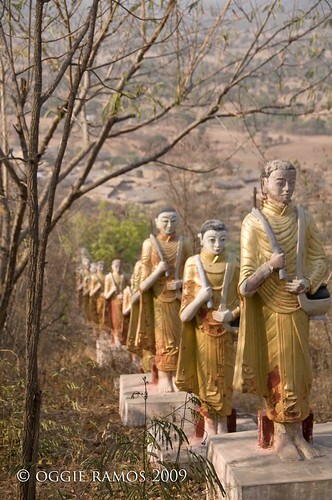 Statues line up the hills leading to the pagoda where I see a family paying a visit. The main stupa is resplendent in the afternoon sun, the floor still hot to my bare feet. Iwander to the steps descending to a deck with a breathtaking view of the nearby hills, the dry plains bathed in golden light.I waited for a glorious sunset but alas, the dusty air obscured any opportunity to see the fading sun kiss the earth. For a while, I wondered if I should've stayed in Bagan but then again, I thought I didn't mind going to this rather more obscure pagoda. This wasn't a textbook trip and maybe, I'm just following a different script altogether. the first photo is really stunning. looks like the ones seen on national geographic. i sometimes wonder, that if there's someone who can be part of the national geographic team it would be you. galing mo kasi kumuha at magsulat. hirap din pala kung hindi ok ang nakuha mong guide. Very interesting post, it seems that there are so many stupas in Myanmar, but this one in your last photo is one of the most amazing I have seen. pangkain at nag-siesta pa LOL. uy dom, thanks bai. speechless ako dyan sa tinuran mo. getting on nat geo is a dream. about guides, it's a hit and miss thing. sometimes you get someone very pleasant and knowledgeable, sometimes you meet someone like this one. i think it's all part of the learning process while on the road. other than the lazy driver and his haggling cousin, mukhang ok naman ang trip kasi you have produced some of the best images of myanmar. thanks for sharinf amidst those unpleasant experiences. oman, thanks for the kind words. i guess these are the sort of things that make the trip more memorable, less predictable. i have more perspective now but i can remember being mad at that time. it's a learning curve that gives you the lessons to be flexible, to adjust to whatever happens. sidney, true, true. it's a blessing to have traveled and come back in one piece. I really loved the first photo here even if the sun didn't set lower. 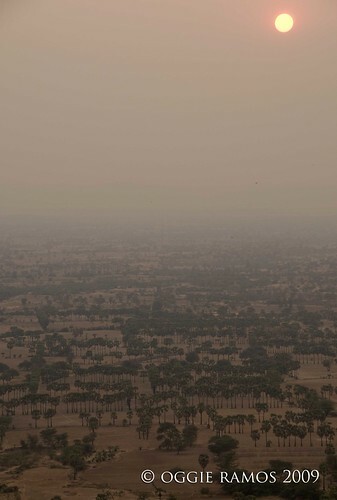 It just shows the dusty but magnificent landscape face of Myanmar. Kakaiba. As for the cart driver, I guess its one of those things we had to deal with when we travel. It can spoil the travel sometimes but it's part of the experience. ferdz, i guess in these parts, ganon talaga yung sunsets. kaya mas buo yung araw kahit sa sunrise, it's because of the dust in the air.